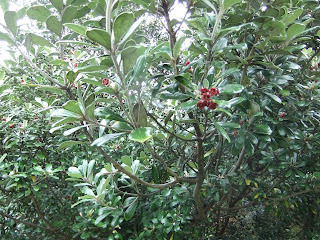 Set the funnel trap here this morning and had a greatly reduced catch with 2 new Silvereyes and 13 recaptures. Amongst the recaps were a few birds not caught here this year including 1 banded in July 09 and not caught for two years. So there has been some movement. Also caught 2 Blackbird recaps both banded in the last couple of years. 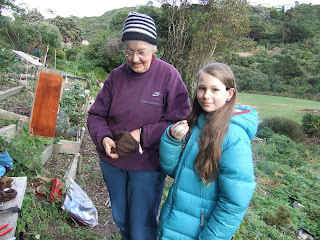 Annette and I spent Tuesday morning at Island Bay and as expected had a much reduced catch. Marion and Ken have had a couple of weeks in Australia and hence the birds haven't been fed on the property but were being fed at a neighbours. I thought it would be interesting to see how quickly the birds returned but obviously not that quick. We only caught 13 birds, 2 Tui, 3 Sparrows, 2 Greenfinch and 4 new Silvereyes and 2 recaps, 1 banded July 09 the other July 10. Also re-sighted a colour banded Tui, it had been banded at this site in July 08, then was seen feeding at a sugar water feeder in Crofton Downs during June & July 09 so had moved from Wellingtons's most southerly suburb to one of the most northerly. In August 09 it was back south at Melrose Park and now is back to where it was banded. I would like a summer record to find out where it breeds. Had a couple of hours at Houghton Bay last Friday to see if birds were coming to the stream in the morning. The short answer is that they are. I caught 37 birds with 33 new and 4 recaps, 2 Blackbird, 4 Chaffinch, 1 Dunnock, 1 Greenfinch, 3 Grey Warbler and 22 new Silvereye and 4 recaps. One of the recaps was banded here at Hornsey Rd so there might be some movement from here to there. I am off to Auckland for some R & R and to catch up on family so there is unlikely to be any posts for the next 10 days or so. We had a successful session at the Zoo on Sunday with a total of 103 birds of 9 species caught; there were 75 new and 28 recaptures. As expected there was a very low turnout of banders with the majority of our regulars on Kapiti Is. 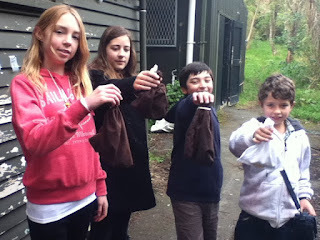 catching Robins for a transfer. This resulted in only half the usual number of nets being put up. Even then we had to foil the most productive net (and furthest from the banding station) for a couple of hours in order to keep up with the flow of birds. So we can only guess at what the numbers might have been with all nets up. We had a group of youngsters who did a good job as couriers. The battery in my camera was flat so this photo is courtesy of Karyne. The couriers with birds, some of the bags have several birds in. Greenfinch – 14 (2) the oldest recap banded June 09 and the other banded at Hornsey Rd. House Sparrow – 8 (3) the oldest banded July 10. Song Thrush – 0 (1) the bird we caught a couple of months ago and the first recap for a number of years. Silvereye – (20) no really old birds this month with the oldest banded March 09. 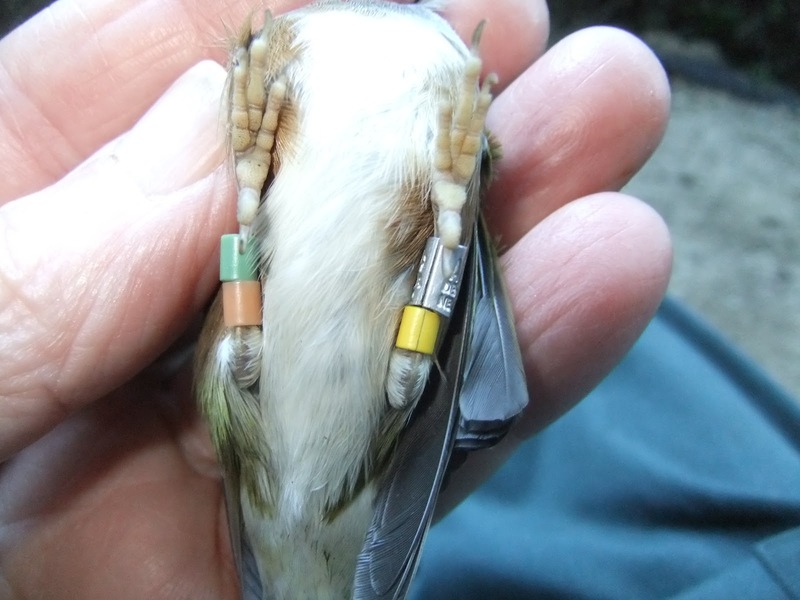 Another was banded at Bridie’s in Hornsey Rd 4 days ago, I wonder if it flew over or around Mt Albert? Tui – 2 (0) surprised we didn’t catch more as there are a lot around the Zoo especially in the red flowered Gums including a colour banded one. This was banded in Houghton Bay Dec 08, seen in Island Bay Jan 09 and later in the Month in Karori. It was then seen at another Island Bay location in Aug 09 but not seen again until it turned up at the Zoo a couple of weeks ago. Set the Funnel Trap again this morning for the weekly check on the Silvereye population. Caught 36 with only 3 unbanded and the other 33 recaptures. With the 3 new and 7 of the recaps not caught at this site this winter it appears there had been some new arrivals.I had the trap set for longer than usual and the slower catching rate suggests that a number of birds have left the area. There were no other species caught today making it a Pure Silvereye day. The other species appear to have learnt about traps but some of the Silvereyes are slow learners with 1 bird caught about 6 times. The 2 older birds from last week did not show up today but A-168374 banded in June 07 did. It was part of a cohort of Silvereyes we colour banded that year to check on the colour fastness of some new bands and this bird appears to be about the last one left. It was banded Yellow/Metal - Orange/Pale Blue but now the Pale Blue looks more like a Green. A-168374 with its colour bands. Also had a visit from a Falcon this morning that caught a bird over the gully below the house and carried it off up the hill. Had a flyover of a Kaka a couple of days ago so a few interesting birds other than Silvereye in the area. With the predicted rain not arriving and the forecast for the next few days being for wet, windy weather I had another session at the Houghton Bay Stream this afternoon. I tried to con a couple of people into joining me but to no avail. In all I caught 38 birds of 5 species in a couple of hours with 31 new and 7 recaps. Blackbird - 1 (0) I actually caught the same bird 3 times. Chaffinch - 2 (2) The oldest recap was banded in April 09 and is now the oldest Chaffinch banded and recaptured at this site. The band on the Chaffinch although only 4 years old was showing considerable wear. Silvereye - 25 (4) 1 of the recaps was banded in the Gully below my house another, which was banded at the stream in Jan this year, was recaptured at my place a couple of weeks ago and has now returned to Houghton Bay. 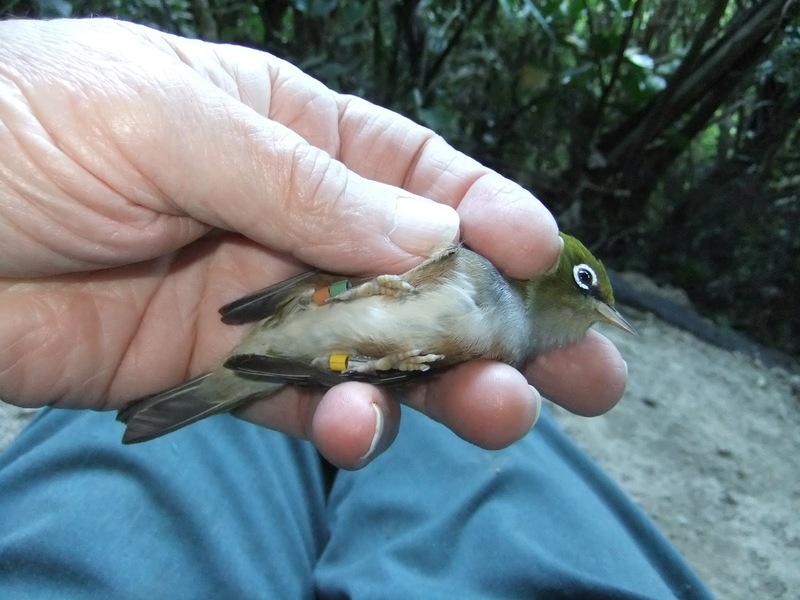 The oldest recap was banded in Dec 2008 and is now the oldest Silvereye banded and recaptured at this site. 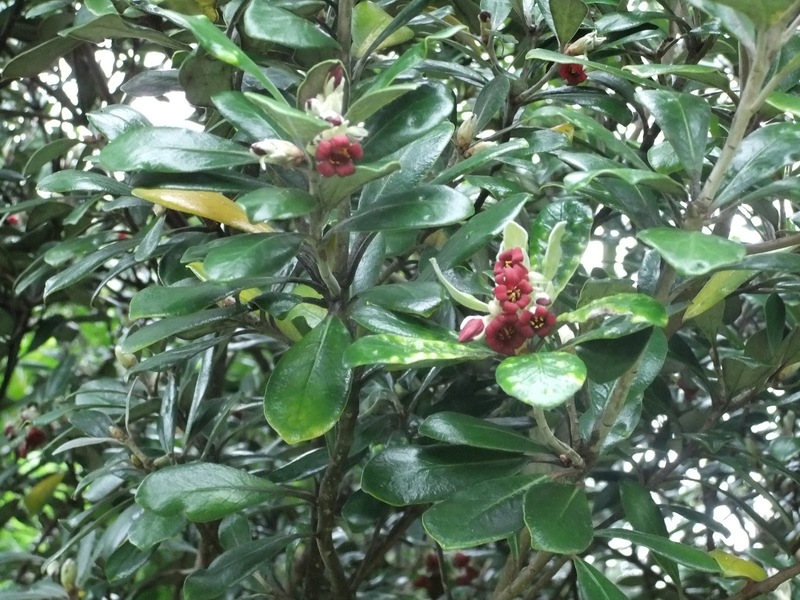 The Karo growing in the Houghton Bay valley is starting to flower and although it is a NZ native, but not native to the Wellington area, it is starting to dominate patches of rejuvenating bush in the valley. 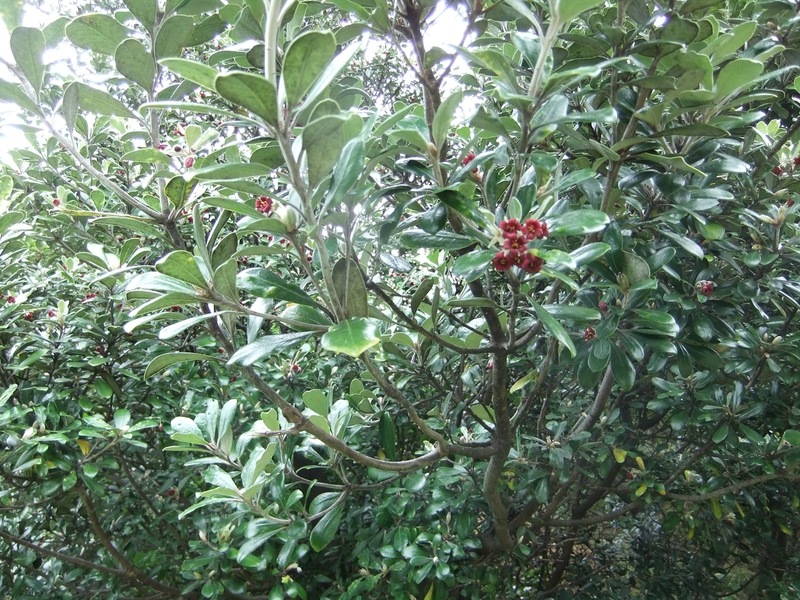 It must produce big quantities of nectar for such a small flower as in this area it is a favorite food for Silvereyes, in particular. It also seems to make them thirsty making them easier to catch at a water source. Had a quick session at the Houghton Bay Stream this afternoon primarily to see if there were many birds about and if the karo was in flower. 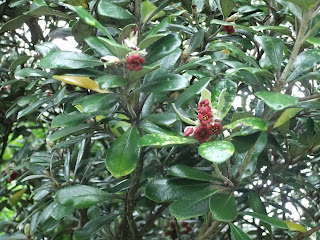 I had a look a few days ago and there were very few birds and no flowers. This afternoon I caught 25 birds in just an hour so there definitely are birds there. It was nearly 3pm by the time I was set up and no doubt I would have caught more if I had been earlier. The birds caught were 2 Chaffinch, 1 Grey Warbler, 21 new Silvereyes and 1 recap which had been banded 7/1/2010. The karo is just starting to flower so it will be interesting to see if large numbers of Silvereye turn up in the next few weeks as they did this time last year. There was a group of youngsters playing games in the bush near the site and they arrived just as I was banding the last bird, the Grey Warbler. They took a considerable interest in my activity and posed for the release of this bird. 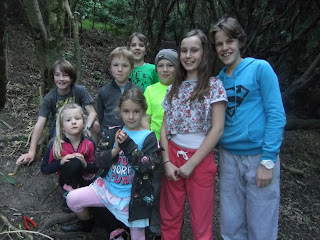 The kids with the Grey Warbler before its release. 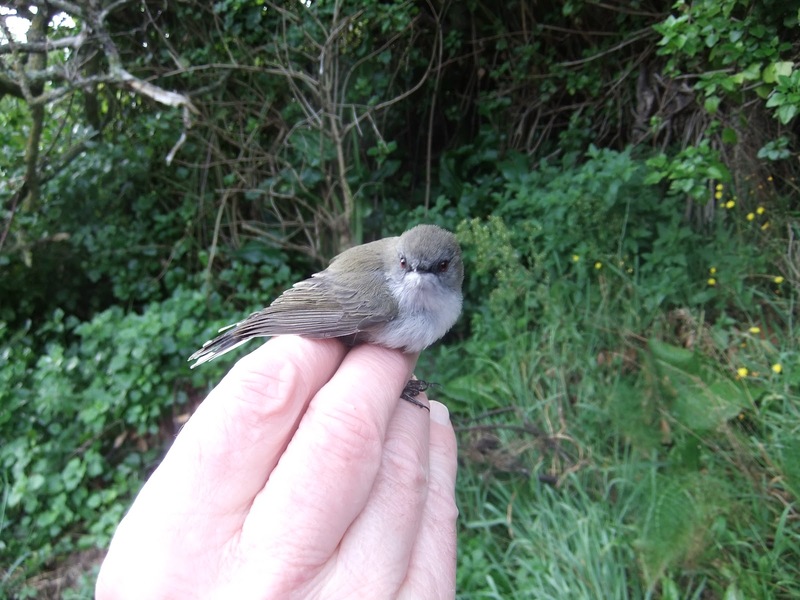 Set the Funnel Trap this morning to check on the local Silvereyes with some success. Caught 39 with 8 new birds and 31 recaptures. The 8 new birds as well as another 10 which haven't been caught at this site this year indicates that there has been an influx of new birds over the last week. Two of the recaps were of a reasonable age, A-161829 was banded 11/2/05, 2705 days ago and A-154943 banded 11/2/03, 3314 days. This bird is now the 3rd oldest Silvereye the group has recaptured in the last 20 years; both these birds were last caught in 2009. The bird caught at the Zoo last month was our 3rd oldest Silvereye but is now relegated to 4th, interestingly though the two were banded in the same week. If we catch the Zoo one this month it will reverse the positions. Both birds will need to be caught next year to threaten our two oldest that were recaptured at 3737 and 3817 days. In spite of the new birds caught today Silvereye numbers have been surprisingly stable since early May with weekly catches of 21, 38, 28, 39, 39, 38 and 39. Other species caught this morning were 2 Blackbirds, 1 Dunnock and a Starling. 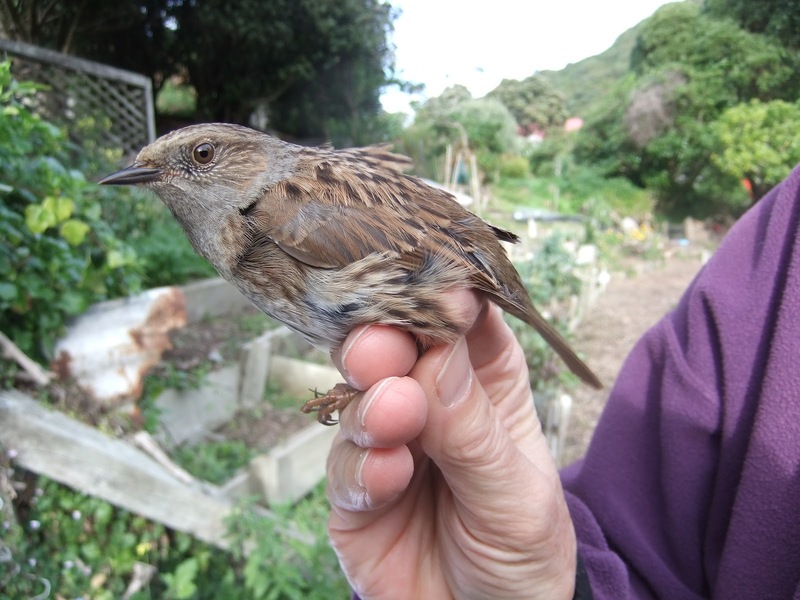 Had a banding session at Blythe St Berhampore this afternoon. The site is in the back garden/ lawn where Rose the lady of the house feeds birds over the winter months. She feeds them regularly about 3 pm with the birds gathering for about an hour before. There is just enough room for 1 x 6m net along one side of the lawn where birds can be flushed in. House Sparrow - 20 (1) the recap was banded in Island Bay back in March. Silvereye - 6 (6) 1 of the recaps was banded at this site a year ago 3 were banded in 2010. 1 was banded at the Houghton Bay stream in March 2011 and the other here at Hornsey Rd in June 2009 with this being the first recapture since July 09. This is the third year I have banded at this site and in previous years there were far more Silvereyes with a much higher new bird to recap ratio. This is becoming apparent at most sites and probably indicates a low breeding success over this last spring/summer. Another change from the last couple of years is the complete absence of Greenfinch this year which have previously made up a large % of the catch. Rose is a very good gardener and has, as well the ornamental beds where I band, a large vege garden and she often sends me home with a great selection of fresh vege which is greatly appreciated by Ruth and me. Kate, Ros and I spent a productive few hours at the Houghton Valley School this morning with, despite the forecast, good conditions.In all we caught 33 birds of 5 species with as expected the majority being Silvereyes. Silvereyes - 13 (13) All the recaps except 1 were banded at this site either 2 weeks ago or on 5 July last year, the exception was banded in the Gully below my house in May 2010 and has been caught at a couple of sites since and now at the H V School. 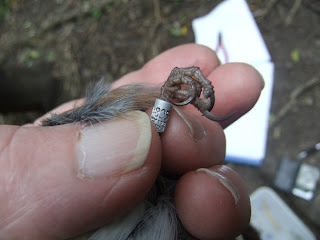 Grey Warbler - 0 (1) The recap was banded last January as a juvenile at the Houghton Bay stream at the bottom of the valley. Although still in it's first year the Grey Warbler is already getting the red eye of an adult.